As far as I can tell, a Polar Vortex is good for one thing and one thing only. Downtime. House Candy Andy is snowed in, which means he's not shouting for me every ten minutes to decide where I want a radiator pipe, how high I want a skirting, which particular style coving I had in mind and, whilst I'm choosing the en-suite, can I be quick with the cuppa. Tea, half a sugar in case you want to join his waiting list. So yay for The Beast from The East and the opportunity (wifi permitting) to update you on the hallway situation, which I know you've been worried about, as have I. It's fine. The panelling is still very raw and a bit masculine for my liking, but now that the paper is off and the new plaster dried, I can see that it's going to be great. In fact I've even agreed to just a weeny bit more woodwork. I know, I know, I was all about overkill last week, but I've figured out an opportunity for extra accessorising and in my book, that's never a bad thing. In this instance, I wanted somewhere on the stairwell to flaunt my love of flowers... and then I remembered Rule No 3 of my (yet to be published) laws of decorating: No one ever regrets an extra shelf. See below for details. I'm going light guys. Sorry for all you dark divas out there. I get that it's cool and all, but it's not me. Not here anyway (though I may reveal a dark side to my character elsewhere in this renovation). However daring I start out colourwise, I finish the day French. Light, airy, nonchalantly elegant and above all CHIC. The decorator is with me next week so I'll have definitive colour choices then, but expect pale and interesting, rather than dark and dramatic. Okay? I can sense disappointment, don't panic. I will style this one out, you see if I don't. I've been in my absolute element choosing lighting and mirrors. 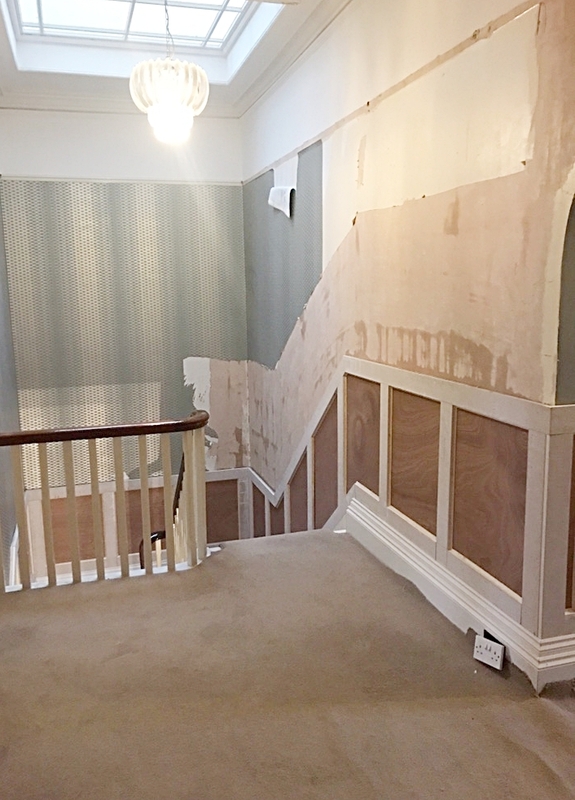 I don't want to spoil the big reveal, but suffice to say, here's where I'm balancing out all the hard edges of the panelling with some signature boho glam. I've chosen the main three lights from my fave online interiors store www.ohwhatsthis.com and they will soon be added to my style picks (which means you get a 10% discount on them too). I'm looking for a classic, timeless feel to the hallway, which, as it joins up all the rooms, feels like the main artery of the house. Timeless is key because of course, I AINT EVER dramatically changing this space again. Just thought I'd be clear on that point. We can change it up accessory-wise as the fancy takes us, but this is the last major overhaul for this space under our care. FACT. I plan to add interest with art, mirrors and of course a few vintage accessories, but I doubt I'll be going overboard in my new found appreciation of SPACE. I've really enjoyed the clarity that has come from starting with a blank canvas. I'm loving unpacking boxes and only putting back what I love. This phase may pass, (although my husband hopes not) but for now I want to appreciate each piece of the jigsaw that pulls the final look together. Space, I have discovered, helps with that. Whilst on the subject of my new, holistic approach to decorating, I should warn you that I've had a bit of an epiphany of late. Along with the Polar Vortex, these Easterly winds seem to have swept in another Beast; Me, on a mission. I could go on for hours about how this whole renovation process has changed my style, but it's also stirred something deep inside. No, not a hernia - although I am haemorrhaging pound notes right now - what I mean is, it's brought about a more considered approach to interiors and a more mindful me. Expect BIG changes here on the blog in the coming weeks and months as I pull the rest of the decor together and reveal the positive steps I've taken to nurture the soul of my home through interior design. Sound smug and a bit annoying? I really hope not because that's the last thing I want to be, but I do feel there are basics of creating amazing living spaces that are not really discussed on interior blogs and yet hold the key to truly fulfilling homes. In other words, there's more to this decorating lark than creating gorgeously Instagrammable rooms and I would love to share with you some of the things I've learned. Change is afoot and I could not be more excited. But first, can someone tell the Beast from the East to do one, I've got a house renovation to be getting on with and the best my builder can build is a snowman. This will house a fire grate to defrost footballer's frozen toes and also provide a handy log store for the house. The new front door arrives next week and the floor has been chosen already so I'll look forward to sharing more photos with you in my next post. Happy snow day(s) and more importantly, I'd be a very bad Pricey if I didn't wish you all a Happy St Davids Day. My hall has got a hangover! Help me I've been panelled! Seriously if you stand still long enough round here you get a piece of 6 by 4 screwed into you. That's what happened to the hall this week and I can tell you it was not a pleasant experience. Never mind the dust and the noise, there was that sick feeling in the pit of my stomach that I'd overdone it. The morning after the first run of panelling had gone up I couldn't look at it. OVERKILL. I panicked. I felt the burning need to hide House Candy Andy's circular saw before the place turned into a period drama room set. How did I let this happen you say? Greed, that's how. Filthy, stinking GREED. Hopefully you've been there at some point in your shallow existence too? When you love something like I love the dark blue panelling in the kitchen/diner and you want more. KNOW WHEN TO STOP PEOPLE. So it's done now and I will have to live with the extra layer of dust that will gather weekly on the grooves for the rest of my life. As extra punishment, I've also had to scrape off the extravagant Farrow and Ball lattice wallpaper I pleaded for about 5 years ago. It was all too much see - panels, patterns, picture rails (sicky mouth). Instead, I now need to spend some time un-restoring the hallway. Stop it looking too OTT and ridiculous. I must tone things down to let Andy and Paul the joiner's really rather marvellous handiwork appear - not as a greedy afterthought - but as the beautifully strategic architectural detail that should always have been here. I plan to simplify things with soothing hues, modern lines and elegant lighting. Interior wise, I need to do the equivalent of swallowing an alka seltzer. House Candy Andy also needs to put the circular saw away once and for all. It's given me a headache. What are your thoughts on panelling? Love it or loathe it? Have you ever overdone it interior wise and lived to regret it? Let me know in the comments section.